Do Contracts Need to Be In Writing to be Enforceable? Generally, contracts come in two varieties – written or verbal – both of which may be legally enforced depending on the circumstances. Verbal contracts can be difficult to enforce because often there is no solid evidence of the specific terms of the agreement. While verbal agreements under the right circumstances may be enforced, certain agreements must be in writing to be binding. 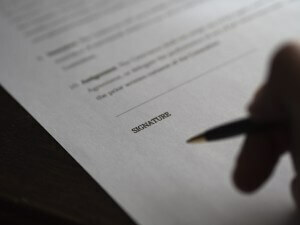 With written contracts, it is critical that all the essential terms or elements of the agreement must be laid out or the else the parties’ intent may be unclear and the contract deemed ambiguous. The Uniform Commercial Code (UCC) refers to the enforceable laws of commerce throughout the United States. Each state has adopted a version of the UCC within its statutory laws. It’s important that specific state laws are checked in an effort to make sure a contract is compliant. Article 2 of the UCC applies to contracts. UCC Section 2-201 states that any contract for goods with a value or price of $500 or more must be in writing to be enforced. However, there are exceptions to this rule for certain verbal contracts. One example of an exception would be if a buyer receives and accepts goods, in which case a contract between buyer and seller will be enforced. If only a portion of the goods are received, then that portion will be enforceable. It’s always advisable to have any business contract or agreement in writing, although other types of contracts can be made verbally. If something goes wrong with an agreement, having a written contract that is enforceable through the courts is the best way to protect a business’ interests in regard to contract’s subject matter. In many cases, verbal business agreements can be difficult and costly to enforce. If a breach of contract situation occurs or is suspected to be happening, whether resulting from a verbal agreement or written agreement, it’s important to obtain legal advice as soon as possible. Contact the Atlanta law offices of Brownstein & Nguyen for expert assistance involving the specific legal issues involved in your contract dispute and, importantly, to learn how to preserve your legal rights and what remedies are available.